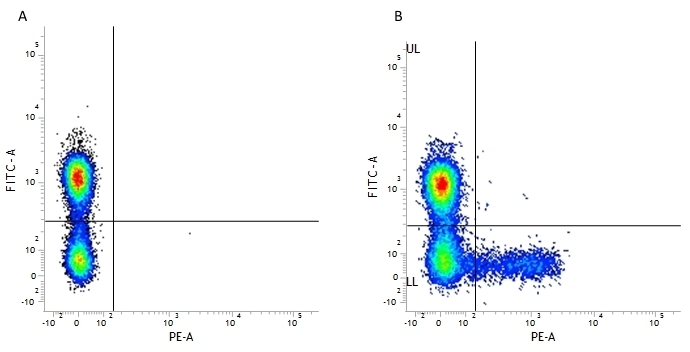 Figure A. FITC conjugated mouse anti human CD3 (MCA2184F) and RPE conjugated Mouse IgG1 isotype control (MCA928PE). 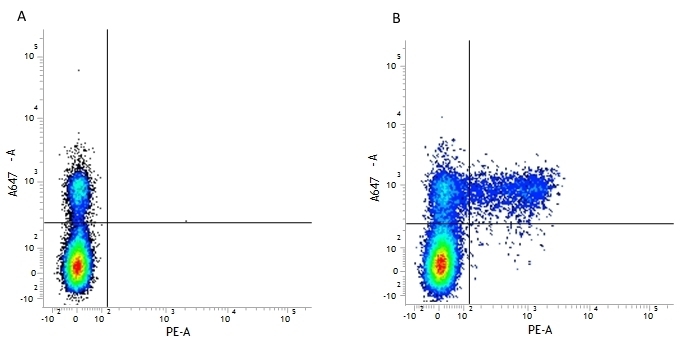 Figure B. FITC conjugated mouse anti human CD3 (MCA2184F) and RPE conjugated mouse anti human CD158a (MCA2243PE). All experiments performed on red cell lysed Human peripheral blood gated on lymphocytes in the presence of Human SeroBlock (BUF070A). Figure A. Alexa647® conjugated mouse anti human CD56 (MCA2693A647) and RPE conjugated Mouse IgG1 isotype control (MCA928PE). Figure B. Alexa647® conjugated mouse anti human CD56 (MCA2693A647) and RPE conjugated mouse anti human CD158a (MCA2243PE). All experiments performed on red cell lysed Human peripheral blood gated on lymphocytes in the presence of Human SeroBlock (BUF070A). Mouse anti Human KIR antibody, clone NKVFS1 recognizes KIR2D members of the killer cell immunoglobulin (Ig)-like receptor (KIR) family, CD158a, CD158b and P50.3. KIR2D family members are cell surface glycoproteins with two Ig domains, which are expressed on natural killer cells and some T cells. Mouse anti Human KIR antibody, clone NKVFS1 recognizes the long and short forms CD158a and CD158b (KIR2DL, KIR2DS1 and KIR2DS2 respectively) and also p50.3 (KIR2DS4). Mouse anti Human KIR antibody, clone NKVFS1 is reported to have functional activity, activating NK cell cytotoxicity via KIR2DS and inhibiting via KIR2DL forms..
Spaggiari, G.M. et al. (2002) Soluble HLA class I molecules induce natural killer cell apoptosis through the engagement of CD8: evidence for a negative regulation exerted by members of the inhibitory receptor superfamily. Spaggiari, G.M. et al. (2002) Soluble HLA class I induces NK cell apoptosis upon the engagement of killer-activating HLA class I receptors through FasL-Fas interaction. Older Aguilar, A.M. et al. (2010) Coevolution of killer cell Ig-like receptors with HLA-C to become the major variable regulators of human NK cells. J Immunol. 185 (7): 4238-51. Patterson, S. et al. (2008) Human invariant NKT cells display alloreactivity instructed by invariant TCR-CD1d interaction and killer Ig receptors. J Immunol. 181 (5): 3268-76. Hilton, H.G. et al. (2015) The production of KIR-Fc fusion proteins and their use in a multiplex HLA class I binding assay. J Immunol Methods. 425: 79-87. Moesta, A.K. et al. (2009) Chimpanzees use more varied receptors and ligands than humans for inhibitory killer cell Ig-like receptor recognition of the MHC-C1 and MHC-C2 epitopes. J Immunol. 182 (6): 3628-37. Van Der Ploeg, K. et al. (2017) Modulation of Human Leukocyte Antigen-C by Human Cytomegalovirus Stimulates KIR2DS1 Recognition by Natural Killer Cells. Wang, Y. et al. (2009) Characteristics of expanded CD4+CD28null T cells in patients with chronic hepatitis B.
Immunol Invest. 38 (5): 434-46.